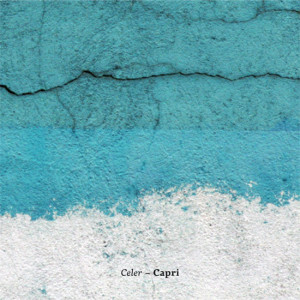 “Capri” by Celer is a beautiful 78-minute work, containing 29 tracks full of piano, strings, horns, acoustic guitar, field recordings and the warm breeze of the Mediterranean sea. All the material for this record was created on Capri, an Italian island on the south side of the Gulf of Naples, during a short summer residency, giving the tracks a very mild and summery feeling. Listening recalls walking near the harbor waves, the salty wind sweeping up the streets, the decayed dwellings set against pristine resorts, and the deep colors of the Blue Grotto. Field recording material is hidden, but in the foreground, just shaded and processed into a breeze. But the warm droning and compact sound carries the spirit of summer-night on a island very, very well. Recorded in a single room with a piano and a few borrowed instruments, and processed either outside a cafe or half-sleeping during the stay, the resulting tracks are only quiet reflections of short experiences. Like all Celer releases you can hear these slowly evolving melodies, first hidden through a slight haze, but getting sharper and clear by-and-by. Some of the shorter tracks are just sketches or fragments, found in the streets blowing by, carried through the air to your ear. The sounds mirror the merest moments, where every tone fits, is left to uncurl, each detail is well considered, and is set with a very high sensibility, haunting the hills and harbor outside the quiet, sleeping Capri. “Capri” is an album in the fine tradition of long, ambient, textured recordings that you might find on the 12k or Spekk labels, except spread across 29 short pieces that somehow compress immersive ideas into much shorter segments. Instead of the hour-long recordings that so often define this sound, Celer tempers longform ambitions into short pieces of utter wonder. Drawing on elements you might recognise if you’re into Shuttle 358, Marsen Jules, Gas, Mountains et al, the shortened parameters imbue each track with an unexpected sense of transience and loss, instead of the extended contemplative listening experience you expect, you find yourself attached, removed and funnelled from each 2-3 minute track to the next with captivating results. There’s also a strange use of panning throughout the album, with many of the tracks shifting from single-channel openings to widescreen stereo, adding to the engrossing sense of transformation. The overall impact is like sweeping over a tapestry of vignettes, with loose threads keeping the transitions delicately connected, held together by found sounds and field recordings recorded on the Italian island of Capri (hence the title), adding to the sense of longing and melancholy. By the end of the 78 minute journey you get a sense of just how emotionally engaging a listening experience it’s been, with narrative, change and introspection all formed around the familiar sound palette of contemporary ambient music and home listening. Absolutely gorgeous material – highly recommended. Unlike Ariill, however, some major surgery could save this record. Sandwiched between the longer drones that compose most of Capri are a number of brief vignettes. Some are pleasant, but more than a few sound alike, while others sound completely out of place or altogether unnecessary. Getting rid of those tracks would relieve Capri of a lot of dead weight, give it more punch, and cure a good deal of the monotony that plagues it. Cutting some of the longer drones out of the record would help, too. Nearly all of them exhibit the same colors, textures, and moods, and not one of them succeeds in sounding like anything more than a washed out blur of sound. Toss a few of those out and Capri feels even lighter and more focused. Beneath all the fat is a coherent record of weightless drones, even if most of them are one-dimensional. Will Long and Dani Baquet-Long have been producing translucent moments of ethereal music since 2005, and this latest album is the latest installment of rich, golden slices of ambience that are fast becoming some of my favourites in this genre. “Capri” takes its name from the beautiful Italian island where it was recorded, taking onboard field recording techniques mixed in with more traditional instrumentation. Stretched out over 29 tracks, the album ebbs and flows with a persuasiveness that keeps the listener coming back to remember or to revisit the various nooks and crannies that decorate the audial landscape. Some tracks come in at less than a minute long, but unlike other interludes so beloved of musicians of this style, these do provide a sense of narrative and cohesion that lace the album with a sense of tenderness. The overwhelming feeling is of a nebulous and amorphous sound, where it’s difficult to trace the source. There’s all sorts of emotion at play here, and it’s the ambiguity that kept me coming back for me. One imagines the two of them getting lost in the back streets of a sleepy Italian village on a hot afternoon and producing music to reflect that experience. The longest track at 7 minutes, “Lint White” is the most obscure, tendrils of noise and barely audible whispers of sound almost out of reach of ones ear intertwining with each other before dissapating into the ether. “Capri” never really awakens from a self-imposed myopic slumber, but given the conditions in which it was recorded in, why would you want it to? Husband-and-wife alchemists Danielle Baquet-Long and Will Long (aka Celer) capture the soothing and enveloping ambiance of the Mediterranean setting in this seventy-eight-minute, twenty-nine-track collection. In fact, all of the material for the recording was created during a short summer residency on Capri, an Italian island on the south side of the Gulf of Naples (two photos included with the release make one want to relocate there immediately). Basking in music of such relaxed character, one can almost feel the gentle breezes and picture the iridescent colours of the seaside locale. From field recordings, strings, horns, processing, acoustic guitar, piano, and organetto, Dani and Will build the tracks into shimmering mini-vistas. Apparently recorded in a single room with a piano along with a small number of borrowed instruments, Capri places piano at the forefront (albeit in extremely altered form), as blurry trails of piano chords unfurl into misty, sometimes softly whistling masses. No field recording details identify a particular setting in explicit manner but, being so warm and lulling, the material itself acts as a transporting aural metaphor. Forced to pick a favourite, it would have to be “Lint White” which entrances for the full measure of its seven-minute running time. Call this another fine addition to Celer’s ever-growing catalogue. I don’t really have time this morning to do a proper write-up of this record as it deserves, but let it be known this is one of the best ambient/drone works I’ve heard in a good little minute. It’s compromised of 29 short tracks making a total play time of 1:17 (!) but don’t be fooled, these pieces flow in and out of eachother like the Mediterranean sea that this album was supposedly recorded near (Celer is/was known for incorporating field recordings into their work, and the ocean breeze here was no exception.) It might just be the artwork and album description rubbing off on my psyche, but this album really does feel very oceanic and blue. Lovely, heartbreaking, underplayed, gorgeous. Pick this one up. During a residency in the Italian island of Capri, Will and Danielle Long found the time – as they always did – to transform the experience into mesmerizing aural pictures which we now have the opportunity to get pleasure from, thanks to a new label from Berlin headed by Christian Roth. The sources utilized by Celer for this particular outing were piano, strings, horns, acoustic guitar, field recordings and “the warm breeze of the Mediterranean sea”. The latter constituent – which used to surround and energize yours truly over the course of ever-remembered adolescent summers spent in contemplation of that very marine environment, only from the shores of Tuscany – encircles the music in combination with a thicker-than-usual aura of recollection, embracing us all along 77 minutes flowing with nary a moment of tiredness. The calming effect of these short pieces equals the sense of silent yearning experienced in those tiny fragments of infinity in which levelheaded beings put the finger on a dolorous understanding of the invisible mechanisms regulating their internal temperament. Capri’s tracks, taken as physical phenomena per se, confirm the amazingly rapid evolution of Celer’s artistic vision. What had started, years ago, as a not-completely-convincing assemblage of loops that could or could not work depending on the choice of the raw matters and the audience’s transitory inclinations, today has become the steady reiteration of a process of metamorphosis: personal experiences into sounds and, in turn, melancholically stirring emotions. It is not easy – except for a recurring piano-based “theme” – to individuate the original instruments under the haze of quiet resonance that the essential substances create, yet the value of this album lies right there: a series of blurred memories, vague images and formless reverberations contributing to deepen the regretful feel of another praiseworthy record which – after Dani’s precocious ascent to the sky – is even more aching to listen to and evaluate, although she remains clearly visible amidst this resounding fog. Forced to designate a “darling release” for 2009 in the sphere of meaningful ambient/meditative electronica, this would definitely be one of the nominees, and the fact that this is a 400-copy limited edition should persuade the hesitant. You must learn the difference between those who were born to identify with vibrations and frequencies and the ones who invented a job for themselves without the necessary underpinning and, especially, profoundness.